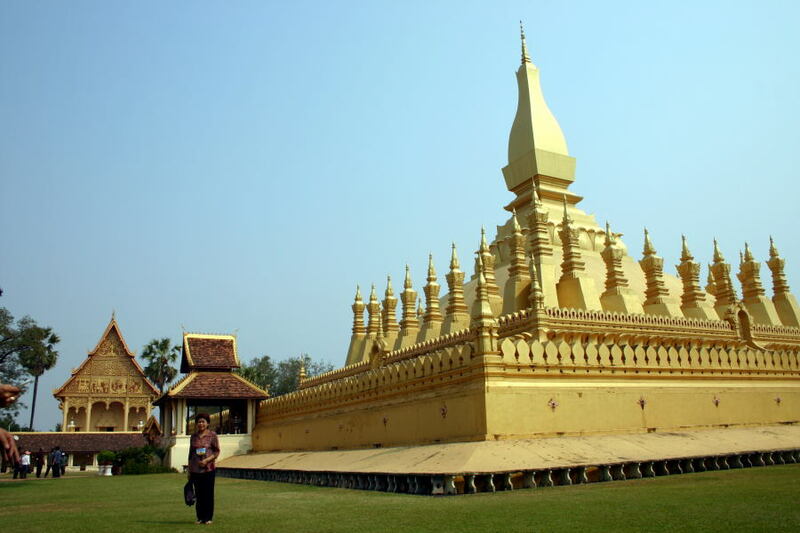 About a mile north of Vientiane's city center is the most important shrine in Laos, the Pha Tat Luang, a symbol of both the Buddhist faith and Lao nation-hood. Many legends surround its origins, some dating it as far back as the 3rd century BC. However, the first actual record of the monument in its current location is from the 16th century. The current structure dates from the 1930s. From a distance, and even up close, it is not a very subtle structure. Lonely Planet describes it as resembling a missile cluster. The mostly concrete structure consists of a central spire rising 45 meters, surrounded by 30 shorter stupas. The main spire sits on a base that looks pyramidal from a distance, but is slightly curved on closer inspection. While the spires and stupas are rather plain, finer details can be seen in the pavilions that stand at the center of each side. On the north side of the lower platform is an extra pavilion that shelters the city pillar (lak muang) for Vientiane. Tat Luang is open from 8:00am to noon and 1:00pm to 4:00pm. Admission is 5,000 Kip (0.60 USD).